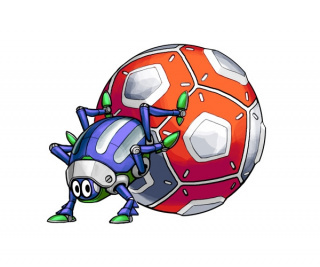 Scarabesque, or Scara (スカラ) in Japan, is a dung beetle-like Badnik from Sonic the Hedgehog 4: Episode II found in Oil Desert Zone. Scarabesques are commonly perched in undesirable locations such as high ledges, and will attack the player by pushing an endless barrage of explosives spheres designed after dung balls in their path. Because of their placement and attack pattern, they are very annoying Badniks to deal with. This page was last edited on 2 May 2018, at 13:22.